How Much is Your Vacation Worth to You? > How Much is Your Vacation Worth to You? Sixty-five per cent of Canadians don't buy, or are unsure if they have, trip cancellation insurance before leaving on holiday, leaving themselves exposed financially if their vacation never takes off. Vacations can be expensive. From flights to hotels, rental cars and excursions, it's easy to spend thousands of dollars on a getaway. Yet, many travellers do not get trip cancellation insurance to protect their investment. According to a recent Kanetix.ca survey, 65 per cent of Canadians do not buy, or know if they have, trip cancellation insurance when they go on holiday. A vacation, however, is worth protecting for at least two reasons. First, to put an actual dollar value to it, Kanetix.ca estimates that the typical vacation costs about $2,938 per person. This is the average trip cost provided by travellers while getting travel insurance quotes last year. And secondly, your vacation plans could go sideways before you've even packed your bags. Why don't more travellers buy trip cancellation coverage? The survey, conducted by Leger using their online panel between January 4 and January 7, 2019, polled 960 Canadians who do not purchase trip cancellation or do not know if they purchase trip cancellation insurance. The margin of error for this study was +/-3.2%, 19 times out of 20. Trip cancellation insurance is often bundled together with trip interruption coverage. Together these two coverages ensure that you're financially protected if you need to cancel your trip before you leave or cut your trip short. It provides compensation for travel expenses that are non-refundable or prepaid. Trip cancellation insurance will not provide coverage if you, for no other reason, change your mind about going on your trip. It will however, provide coverage for situations that are unexpected and unplanned that are outside of your control. For example, you'll be covered if there is a death in your family, you're called to jury duty, you suffer a sudden injury or illness that prevents you from travelling, you're laid off from your job, or even if your home suffers a catastrophic loss like fire or flooding. Trip cancellation insurance can also protect you from Mother Nature. If your travel plans are affected by severe weather like a hurricane or blizzard, an earthquake or volcanic eruption there are provisions that can help you recoup your costs. Similarly, it provides coverage if, after you've booked your trip and purchased your policy, the Government of Canada issues a new advisory suggesting that travel be avoided to your holiday destination. Advisories are issued for a variety of reasons including security, safety, and health concerns, and with trip cancellation coverage you can cancel your trip without financial penalty. If you decide, however, to go ahead as planned any travel insurance coverage you have will be invalidated because you're knowingly putting yourself in harms way. How much does trip cancellation insurance cost? For all of the coverage that it offers, trip cancellation insurance accounts for very little of your vacation budget. For example, the lowest quote at Kanetix.ca amounts to roughly three per cent of the trip's total cost, about $100. This is the premium quoted for a 35-year-old traveller who has spent $3,000 on a two-week holiday. If, however, you need coverage for emergency medical coverage too, an all inclusive plan is the way to go because it bundles everything together-emergency medical, trip cancellation, trip interruption and baggage loss and delay-into one robust policy. 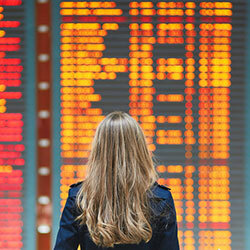 Will your credit card's trip cancellation insurance cover the full value of your trip? If you're relying solely on your credit card for trip cancellation coverage, make sure it covers the full value of your trip. With the average cost of a vacation estimated to be $3,000, you'll find most cards only provide $1,500 to $2,500 in coverage per person. The limit varies by card, so make sure you read your card's policy terms to be sure you've got the coverage you need. Wherever your travels take you, travel confident knowing that whatever comes your way, you have the travel insurance you need to ride out the turbulence. Compare quotes for trip cancellation insurance or an all inclusive travel insurance plan that will protect you financially before and during your next vacation.